Want to know where to go and how to get there for winter snowplay? View the Flagstaff Winter Recreation Snowplay Map to start a fun-filled winter adventure. Flagstaff is a premier destination for fun winter time activities in Arizona to enjoy winter sports and snowplay. Use the Flagstaff Winter Recreation Snowplay Map to find designated snowplay areas and winter attractions with winter safety tips, travel information and road condition contacts. Download the Winter Recreation map or pick it up for free at the Flagstaff Visitor Center in historic downtown at the train station located at one east Route 66. The Flagstaff Visitor Center is open Monday – Saturday 8 a.m. – 5 p.m., Sunday 9 a.m. – 4 p.m. The map is an excellent resource tool and product of a multi-agency collaboration between the City of Flagstaff, Coconino County, Arizona Department of Transportation, and the Coconino National Forest and community. Call the winter information hotline at 1-844-256-SNOW for up to date snow travel information. The hotline is updated daily through the season as conditions change and provides detailed visitor information as winter recreation areas experience operational changes. Skiers/Snowboarders can ride the bus for free to Arizona Snowbowl! There is no parking or stopping on Highway 180. Arizona Snowbowl offers skiing, snowboarding and ski bikes but no sledding. Arizona Snowbowl is located on the western slope of Mount Humphreys on the majestic San Francisco Peaks, 12 miles outside of Flagstaff. Arizona Snowbowl opened in 1938 and is one of the oldest continually run ski areas in the United States. The ski area has State-of-the-art snowmaking to help guarantee a season from mid-November through mid-April to enjoy 777 acres, eight lifts and great amenities plus stunning views of the red rocks in Sedona, the cinder cone volcanic field and Grand Canyon’s rim can be seen from the lifts. In fall 2016, Snowbowl unveiled the Grand Canyon Express: Arizona’s first high-speed, six-person lift which rises 1,500 feet in less than six minutes. Snowbowl has 40 runs and three terrain parks with technical jumps, rails and features. Intermediate and advanced snow riders will enjoy many challenging trails with 2,300 feet of vertical drop. For beginners, Snowbowl has the best learning terrain in the entire Southwest, offering 50 acres in the wide-open, natural meadow of Hart Prairie. Ski lifts open from 9 a.m. to 4 p.m. daily. Half day begins at 12 p.m. Directions: The Arizona Snowbowl is located in the Coconino National Forest seven miles northwest of Flagstaff, Arizona. From Flagstaff, follow the Highway 180 signs to Grand Canyon and turn right (north) on Snowbowl Road. 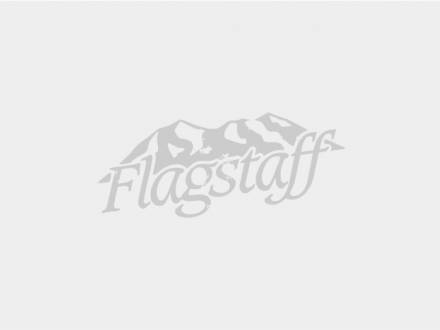 Mountain Express offers FREE bus service from downtown Flagstaff to Arizona Snowbowl. For more information on times and locations of this free service click HERE. Nestled in a snow-pocket of the San Francisco Peaks at an average elevation of 8,300 feet, the Arizona Nordic Village (ANV) is the premier cross-country ski location in Arizona. Located in the foothills of Arizona’s tallest mountain range, you can ski and play in the quaking aspens and pine trees of the Coconino National Forest all the while enjoying the magnificent scenery Northern Arizona has to offer. There are 25 miles (40 kilometers) of groomed cross-country along with a sledding and snowplay area nearby There is no longer a sledding area nearby, but we do have a small snowplay area adjacent to our main parking lot (emphasis on no sledding hill though, just a spot to build snowmen and have fun in the snow). There are also 10 miles (15 kilometers) of snowshoe trails. Stop by the lodge for sledding equipment we don’t have sledding equipment, though we do rent classic and skate skis and snowshoes, and couple pulk sleds that you can tow your little one around in. or to enjoy a cup of hot cocoa and relax while the kids build a snowman. ANV has fun and exciting events scheduled for the upcoming winter season. View the brilliant stars from the deck while enjoying hot beverages and snacks. ANV provides packaged food, trail snacks and hot drinks every day. In the event you forgot your critical gear or don’t have your own, ANV offers an assortment of clothing and gear at the lodge in various sizes. ANV also rents skis/ snowshoes and has a complete ski shop available for tuning and waxing skis. The lodge and trails open at 9 a.m. and close at 4 p.m. We are open Monday, Thursday, and Sunday 8 a.m.-4 p.m. and Friday and Saturday 8 a.m. to 7 p.m., and we offer a $5 trail pass and $5 rentals Friday-Saturday 4-7 p.m., and have a free bonfire and show a movie in the Discovery Yurt during that time, too. Directions: The Arizona Nordic Village is located in the Coconino National Forest 15 miles northwest of Flagstaff. From Flagstaff, follow the Highway 180 signs to Grand Canyon. The parking lot is alongside Highway 180 at mile marker 232. Wing Mountain (closed for the season), Crowley Pit (closed for the season), Peak View Overlook and Walker Lake Watchable Wildlife parking areas provide forest access for various winter activities. Snow play (sledding, tubing, building snowmen, etc.) is not permitted within the Arizona Snowbowl ski area or along Snowbowl Road. Parking is also not permitted along Hwy 180 except in designated areas. Please remember that all these sites have limited garbage service. Littering is against the law and Forest Service Rangers take it very seriously. This paved parking area with a restroom and picnic table is only plowed when ADOT has resources available. Parking is limited, and downhill sledding is not available, but the views are fantastic with open fields of snow nearby for your enjoyment. If this area is full please go to one of the other areas listed. Parking along the highway is not permitted by the Arizona Department of Public Safety here or at any other location. Directions: Peak View Overlook is on Highway 180 approximately 6.5 miles north of Flagstaff on the right side of highway (astraveling from Flagstaff). This location is paved, has a restroom and is only plowed when ADOT has resources available. It opens up to the vast fields in beautiful Kendrick Park, is a good location for snowplay and is ideal for cross country skiers and snowshoers to explore the sunny meadows. The trails are not managed here so stop by a local Forest Service office for maps and information if traveling into the backcountry. Directions: Follow Highway 180 north 12 miles past Snowbowl Road to mile marker 235. Turn left onto Forest Service road indicated by green parking signs. Visitors are welcome to play in the snow, snowshoe and cross-country ski. It is a great place to build a snowman and there is a small downhill sledding area. The Flagstaff Snow Park located at Fort Tuthill is dedicated to providing exceptional snow play opportunities with activities from groomed tubing runs to a designated kiddie hill or build a snowman, or relax and watch the action, it's entirely up to you! Roast a New Year’s Day marshmallow at one of the many outdoor fireplaces and create memories to last a lifetime. The park is open from dawn to dusk. Directions: Located two miles south of Flagstaff, on the west side of Interstate 17/Highway 89. Take exit 337 – the park is on the opposite side of the Interstate from Flagstaff Pulliam Airport. Enjoy ice skating at Jay L. Lively Activity Center. For a small fee, lessons, public skating, figure skating and hockey are offered. Rental skates are also available. Just up the hill Buffalo Park offers a vast network of trails, including access to the Flagstaff Urban Trails System (FUTS), National Forest trails and the Arizona Trail. With spectacular views of the San Francisco Peaks, Buffalo Park offers a vast network of trails, including access to the Flagstaff Urban Trails System (FUTS), National Forest trails and Arizona Trail. Situated on 215 acres, there is a two-mile trail loop, parking, portable restrooms, one 24 x 20 foot handicap accessible ramada and plenty of large open spaces. Buffalo Park’s trails and amenities are maintained on a regular basis year-round. Open dawn to dusk and located within city limits at 2400 N. Gemini Road, Buffalo Park is ideal for winter sports such as cross-country skiing and snowshoeing; however, no sledding is allowed in Buffalo Park or other city parks. Directions: From S. Milton Road (off I-17N), take a left at Humphreys Street, turn right on Columbus, travel one block east and turn left on Beaver Street and continue uphill. Next turn right on Forest Avenue, continue east uphill on Forest Avenue and at the top off the hill turn left on Gemini Street to Buffalo Park parking area. In the heart of historic downtown Flagstaff on Route 66, enjoy “Skate at the Station,” a skating rink at the Flagstaff Visitor Center. Delight in soaking up the New Year as people swirl around and marvel at our Arizona Winter Wonderland and create a New Year’s Day tradition. After skating with your family and friends, warm up with a hot beverage served from one of our local baristas, then complete the experience by shopping in our historic downtown and top it off by picking a spot to dine in at one of the many one-of-a-kind Flagstaff restaurants. Remember to bundle up and grab the mittens for this new outdoor skating experience in the heart of downtown Flagstaff. For a small fee, lessons, public skating, figure skating and hockey are offered. Rental skates are also available. Directions: From S. Milton Road (off I-17N), take a left at Humphreys Street, turn right on Columbus, travel one block east and turn left on Beaver Street and continue uphill. Next turn right on Forest Avenue, continue east and turn left at traffic light on Turquoise Drive to Jay L. Lively Activity Center parking area,1650 N. Turquoise Drive. At 7,000 feet above sea level, and with an average annual snow fall of over 100 inches, Flagstaff is one of the snowiest cities in the United States. Flagstaff Snow Park is dedicated to providing exceptional snow play opportunities for visitors to Northern Arizona. Let's play! The Mormon Lake Lodge Winter Activity Center offers cross-country skiing and guided snowmobile rides. The center is open daily from 9 a.m. to 4 p.m. when snow conditions are favorable. The latest departure time for snowmobiling is 3:30 p.m. and cross-country skiing is 3 p.m., with a return by 5 p.m. Ample parking and restrooms are available. The Steakhouse serves breakfast, lunch, and dinner on weekends and dinner on weeknights during the winter. The Country Store is open everyday for coffee, hot chocolate, snacks, gas, diesel, gifts, winter clothing and supplies. The Saloon is open daily beginning at 11 a.m. Full bar service is available as well as specialty winter drinks and a bar menu. From skiing at Arizona Snowbowl and sledding with the kids to holiday events and New Year's Eve celebrations, Flagstaff is the destination for your winter retreat.